We managed to get our hands on the hot new Canon 5D Mark II camera and put it through the paces. This is an extraordinary hybrid DSLR. The 1920×1080 HD movies produced by this camera are jaw dropping. While the lack of manual controls in movie mode and the poor audio quality leave a lot to be desired, the visual clarity and film-like depth of field are sheer awe inspiring. I haven’t been this excited about a still camera since the early 90’s when I got my plastic Holga medium format camera. The next cool thing I’ve found about the camera is that you can use older lenses with the Canon EOS 5D camera via lens adapters. For less than $150, I was able to purchase a Canon EOS to FD lens adapter while at our local camera shop Kenmore camera in Seattle. Very cool! On the spot I was able to look through their glass cases full of used equipment where I quickly singled out a beautiful 70-210mm lens for a whopping $89! I giggled with glee in the store as I practiced rack focusing on a few fellow customers. My, my, this camera is a game changer folks. I have shot with $20k+ cameras, and the video footage from the Canon EOS 5D Mark II is as good or better! No, you do not have the smooth zooms of your video camera nor smooth autofocus or the nice physical balance, but is the camera worth owning? If you don’t have to shoot live events or need continuous takes longer than 12 minutes, then I would call Obama and tell him you need $2,699 to help do your part in stimulating the US economy. Yes, that is the price of the body only. The kit with 24-105mm f/4L IS USM AF Lens is fetching $3,499. I’m using the Canon 24-70mm f/2.8 USM AF lens most of the time. The newer professional lenses from Canon are tack sharp and offer advanced features such as image stabilization and ultra fast auto focusing. The bummer about the “old skool” lenses is the lack of auto focusing, and my HAMA lens adapter has the aperture stuck wide open. The Fotodiox EOS to Nikon lens adapter looks like the way to go if you want some inexpensive lenses. Of the many photographers switching over to video, I foresee three prominent points of potential failure unless they are addressed. Audio– use a separate recorder for the best results. A small device such as the Edirol R-09 portable recorder will provide a clean track and allow headphone monitoring. A quick clap of the hands at the beginning of each take will give you a spike in the waveform to visually sync to in post. If you want to use XLR based mics and can handle the AGC (Automatic Gain Control) pumping, consider the new BeachTek XLR adapter which is specially made to match the 5D – complete with phantom power and headphone jack! So far, the cleanest out of the box semi-pro audio solution I could recommend is the Sony UWP wireless system. It comes with a lavalier, and you can also add the RODE NTG-2 shotgun mic. You would make the shotgun mic wireless via the Sony plug on transmitter. The cool thing about this system is two fold – you get headphone monitoring via the Sony receiver – and you get a clean amplification of the signal via the transmitter and the receiver. If you just hook the shotgun mic directly into the camera – the 5D’s “subpar” preamp will give you hissy audio. The other cool thing is that knowing the key to great audio is getting the mic closer to the subject, therefore you’ll want to use a little mic stand or tripod you can the mic right next to your subject. If you a dedicated sound person, then a boom pole would be best. Here is a great example of a wireless mic in use with the 5D for a short project. Note that the system used is the Sennheiser wireless, which normally would be the model we would recommend for a traditional video camera with built-in headphone output. Since the 5D does not have the heaphone output, the Sony solution is less expensive while also allowing you that ability to monitor your audio with headphones. You do not want to be “flying blind” hoping that you’re getting great audio in a critical project. Moving camera– one of the coolest and least expensive set-ups is the 15′ of dolly track. I’m amazed at the quality that one can deliver with simple dolly moves. Very simple to push a dolly and achieve Hollywood caliber moves that rival the best fluid head moves. For handheld, a Steady Stick or a new mount from Bruce Dorn called the U-Boat commander looks interesting. Most photographers are going to scoff at the price and learning curve of a Steadicam stabilizer with full vest and arm, although that is the best option on the planet. Take a look at some of the Steadicam work by wedding photographers Still Motion. For an affordable solution, I like the panning ability of the Manfrotto monopod. With the monopod, you now have a steady shot and can still quickly move from position to position. Focus– along with the shallow depth of field look comes the need to address sharp focus. Before pressing record, you have a great 5x and 10x zooming ability with the camera – access is nice with the button being easy to press with your thumb (it’s right next to exposure lock). The expanded view allows for checking critical focus before pressing record, however it is disabled while recording. We’ve been using the HDMI connected IKAN 8″ HD monitor mounted on the camera’s accessory shoe. However, a more exciting model has been released from Marshall electronics in March ’09. The Marshall model offers something called “peaking.” Video professionals that are accustomed to using full-sized broadcast cameras are familiar with this feature which turns the screen black and white and shows a red outline around items that are in focus – racking focus back and forth shows more or less red. You can also hit the pixel to pixel mode which will zoom the image in 1:1. I’ve tested the monitor and love it. You can use pixel to pixel and peaking at the same time! For follow focus – take a look at some of the options from Redrock Micro and Zacuto. H.264 compressed clips are not easy to work with in an NLE so you’ll want to transcode to a less compressed, less processor intensive codec. In post, we’re taking the H.264 clips generated from the 5D onto a compact flash card through Apple’s Compressor and transcoding to ProRes 422HQ. The file size jump using ProRes goes from 5MB/sec compressed to 22MB/sec. Holy drive space batman. That’s about 80GB/hr. Update 1/22/09 : Please note that if you are using Apple’s QuickTime, upgrade to version 7.6 for a wider color gamut. The coolest aspect of shooting with the Canon 5D for me has been this new found notion that I can look at everyday life a little differently. I look at the world around me and think, “Would that make a cool virtual set?” With chroma key technology, you can take a still image or a movie and walk back into that environment whenever you please. This opens up a whole new world. Take a look what you can do by watching the sample below. Chroma key with the Canon 5D and Reflecmedia. Oh yeah, and it’s a great still camera too! 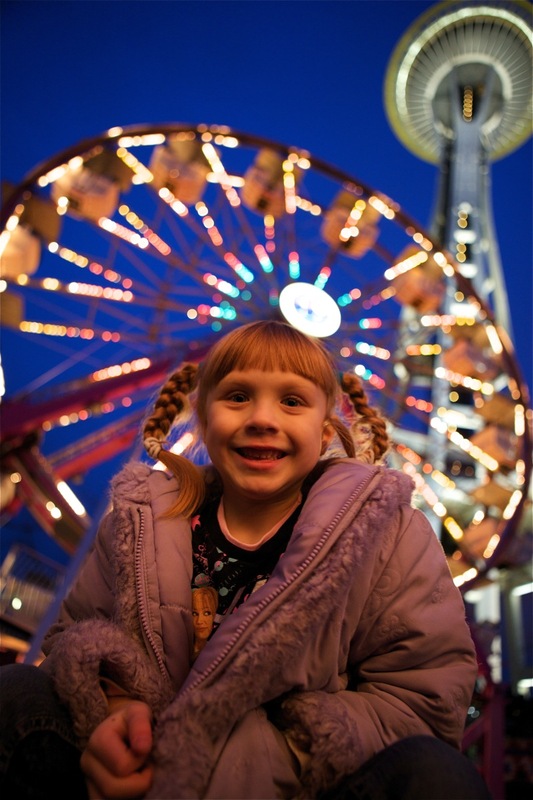 Here is a shot of my beautiful 5-year-old daughter – taken handheld in “Full Auto” mode with available light. The clean, low light capability at ISO 3200 is something that still photographers have been dreaming of. Most of the shots of the hotel in the video above were taken handheld at ISO 1600 or ISO 3200. This shot above was taken at ISO 800 1/25 F2.8 – with a non image stabilized lens. Live view is accessable for taking stills so you can frame up your shot on the gorgious 3.0″ LCD screen. In exposure simulation mode, you get a great idea of what the shot is going to look like before you squeeze the shutter. Great review. I called Canon to see if they had plans to utilize the on-camera mini HDMI out to their Canon Console software (used for the XL series). In theory this would increase the file capture size and place the capture directly on the hard drive of a laptop. They did not have plans for this generation. I may wait until this is possible. I guess one could enlarge the image 10% or so to compensate in post or using a live switcher. Hi Guy. Just wondering if there is a way to check if the HDMI output from Live View + Face Detect AKA the black bars output without overlay is compressed HDMI, 8-bit HDMI or true 10-bit 4:4:4 HDMI. Unfortunately HDMI supports compression. HDMI can also be 4:2:2 or 4:4:4 and pseudo 10-bit colorspace (the first 2 bits are zeroes so its essentially 8-bit like the HV20 output). I do not have access to a resolution chart, so I have no way of telling if this output is true uncompressed 4:4:4 10-bit HDMI AKA HDMI 1.3 or HDMI 1.3a. Thanks a lot for the review..
Hi Anmol, I am fairly certain it is 8-Bit, however I have no way of confirming. Have you been able to find a way to get rid of the square box tracking faces during face detection? Hi Guy. I am also trying to see what this signal is. Still not sure if its uncompressed. An uncompressed 4:4:4 8-bit is still better than nothing. Now, in my limited test with my friend, we turned off overlay, put in video mode and either turned face detection on or off to get rid of the rectangle. That was the setting and we had an image with 3:2 aspect and no box in the center. where is the menu function to get rid of the super imposed sqaure? I have lookked thought the custom functions and cant seem to find it? As of 7/1/10 the only way to turn off the Super Imposed White Square on the Canon 5D Mark II is to switch the Auto Focus mode to “Face Detect”, however, the white square may come back momentarily when it detects a face. Can you set exposure manually in video mode? I revised the article. It is secret again, there is actually a few things someone will need to make it work. The exposure is Auto – however you can use Exposure Lock and some trickery to get repeatable results. Very good overview from the video guy perspective, I really like the audio section since I dont know much about sound recording. The Reflecmedia thing is awesome, if I could just find a use for it I would get it right away. any flickring wave problem under fluorescent light like nikon D90’s ? what’s the blue light thing on the front of the lens? That is the Reflecmedia litering. It is used for Chromakeying. Watch the video above. Thanks for the excellent work on this article. I’m a little hazy on the audio however, perhaps you can clarify. With the SONY wireless don’t you still have to plug it into the 3.5mm on-camera jack and deal with AGC like with the Beachtek? And if so, don’t you have some manual control with the preamp pots on each of the SONY and Beachtek units? I’m assuming, just pluging in a 3.5mm external mic you are using the lousy Canon preamp whereas if you hook your mics up to an external unit like the SONY or Beachtek you “override” the Canon and offer a somewhat cleaner audio solution…correct? Thanks Bill. If you want pristine audio, you’ll want to record to an external recorder. That is if you have a super important project. For 80% of folks, the Sony and Sennheiser wireless system are going to give very useable audio, way better than any on camera mic. We’re exploring mounting different recorders and syncing them up with a system. The upcoming BeachTek will carry a tone which can defeat the AGC. See this vid http://vimeo.com/3072099. We have a system that we are testing which is too expensive and complicated for the average user, so we’re just going to keep trying. There is some other companies working on project which I am unable to discuss publicly yet. Just know that we are all out there coming up with a solution. Thanks for reading, and thanks for your comments. How do you monitor the levels with the Sennheiser wireless system? Do you just judge what’s going into the camera by the Sennheiser receiver? Also you can see this nice little movie made with mark II http://www.vimeo.com/2697471. The Canon EOS 5D Mark II will show a — for the F Stop when a third party lens is attached. You can then manually choose your Aperture. There is no way that I have seen to transcode HDMI to FireWire without expensive hardware. Besides, the live HDMI signal out has a superimposed white rectangle on the output making it unusable. The only way to get rid of it is to go into “Face detection” mode and even then it comes on when it detects a face. hello and thank you for your reply. Do you know of another work around to get the signal into the computer and monitor that signal with a program such as onlocation?? I would like to monitor through the computer and capture to the hard disk drive. I am interested in the capabilities of the intensity hdmi capture cards, but I would like to use my laptop due to its portability. There are a few laptop solutions to allow HDMI capture, the AJA I/O HD, Matrox MXO2 and the MOTU V4HD. The point is moot though, unless you’re not shooting faces. We carry all of these IO Boxes if you’re interested in them. I see the problem with the white rectangle. I would record the usable footage to the onboard flash ram card eliminating the rectangle. My main concern is in monitoring signal for white balance and histogram with other features that are available in the “on location” monitoring solution. Would the laptop soluions that you offer allow the onlocation software to recognise it?? Is it possible to connect a Marshall to the 5D MarkII while recording a video so I can see more clearly what is going on during recording? David – the Canon 5D Mark II can not handle a high res HD signal out while recording. Simply not enough horsepower in the hardware. I use HD for setting up, then switch to the SD “Composite” AV cable if I need to constantly focus during a take (at a live event for example). I can focus faster and get much sharper focus with the Marshall monitor in Red Peaking mode. It’s my “confidence” monitor for critical focus. Saves me with shallow depth of field of this awesome camera! Yes, you can connect an external monitor to the 5D Mark II… BUT, you won’t need to! It is a 1 Million Pixel LCD Display. Visually, when it’s in your hands, it is TOTALLY sharp enough to pull focus on, even with an extremely shallow depth of field. Mega sharp. It is seriously the sharpest LCD screen I have ever used. When you do the math, 960,000 pixels in a 3″ display works out to approximately 260 dpi! For what it’s worth, I own a Panasonic BT-LH1760 for my television commercial shoots, and I see absolutely no need for it, when it comes to “seeing clearly what’s going on” when shooting with the 5D Mark II. It is THAT good. Try it out. I think you’ll agree. I’ve connect the 5dmk2 to my brand new Marshall V-LCD70P-HDMI using HDMI cable v.3.2 but the monitor is unable to reconize the signl, “no signal” appear on the screen. Anyone have an idea why that happen ? Question….Using H.264 .mov files from the Canon 5D MC2. Editing in FC Studio 2. Is there a codec to convert to so I can work with & edit with smaller files and then replace what’s on the TIMELINE with High Quality ProRes 422HQ at the END? Also…is SheerVideo Codec everything they say it is? Hey, be careful with using h.264 for commercial purposes. In the small print there is some very tricky language alluding to royalties having to be paid for every copy of the media you produce. Marshall HDMI monitor will change the aspect ratio when the camera is clicked on if you are using the HDMI post. This has been brought to Marshalls attention. Convert your 5d files to pro res 422 using compressor and edit with them. Final cut will work a lot better. I noticed the aspect ratio change on the Marshall Monitor. Very disturbing, though I assumed it had something to do with the Canon output. I hope Marshall can fix it. I cannot get the video to play on my computer in full resolution. I don’t even know what will happen in editing. Is it my processor. Intell core 2 duo 2.6 gh 7500 with 2 gb ram? I am about to send the camera back if I cannot figure out the problem. If you have any insight I would appreciate it. Thanks for your question. Most editors will transcode the footage to a less processor intensive codec to edit and work with. Are you on a PC or a Mac? I am trying to find a way to utilize two of the 5Ds to shoot 3d footage with a beamsplitter rig from 3dfilmfactory. Problem is no genlock. So were you using the canon wireless transmitter unit that attaches to bottom of camera to record the two video streams on a PC or mac? I looked at the tc gen from Horita. Where were you adding the timecode on the other side of some kind of receiver before recording? Last question I promise. Did you notice any kind of drift from the two cameras once you matched up the timecode. I wouldn’t think so since it sounds like you are recording two HD streams Simultaneously. Sounds better than using a film clapper and the onboard camera cards. Thanks. Will the XL-series lenses mount to the 5d? I have a XL2 with the 20x and a manual. If not are there any adaptor out there that will work? 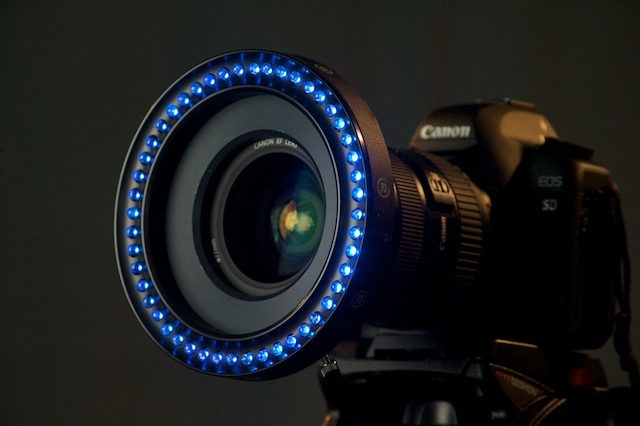 i’m just wondering what the led ring is called and where could i get one?